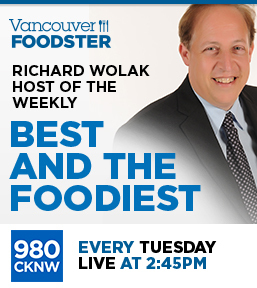 Welcome to the 5th Vancouver Foodster Pizza Challenge. 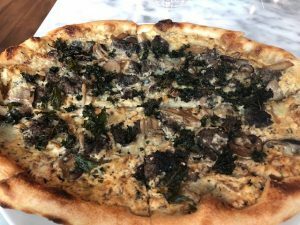 Restaurants from all over the city were invited to enter their pizza into this challenge, some of the restaurants have created a special pizza just for this challenge and others have entered their top choice off their existing menu. 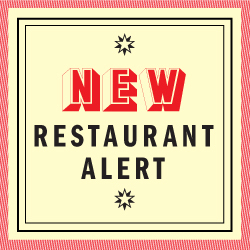 Each restaurant will be featuring their pizza on their menu from April 4-28, 2019. 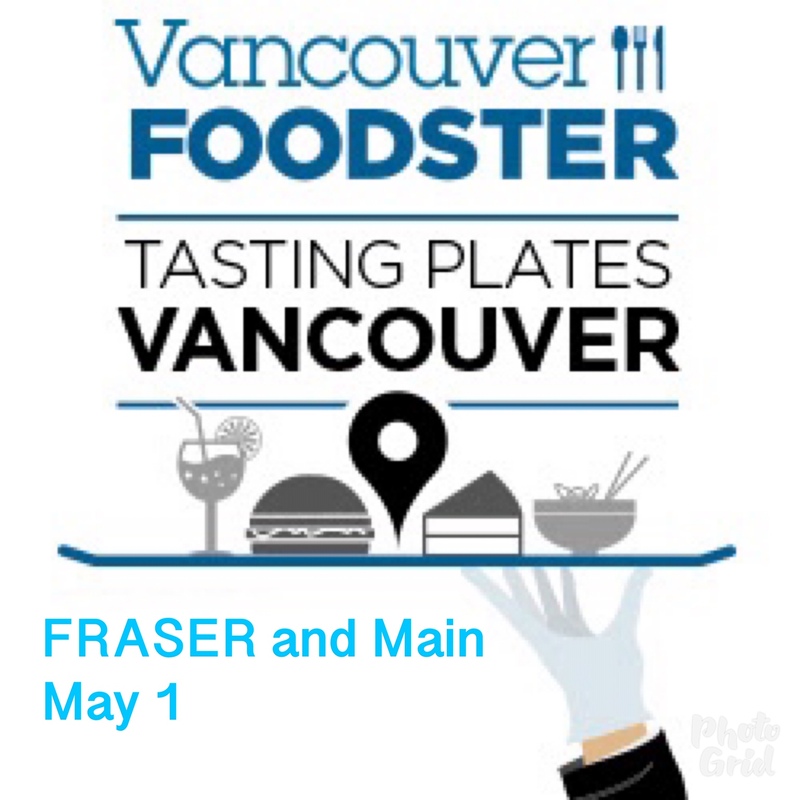 Share your experiences: Tweet (and don’t forget to tweet or instagram your photos) throughout the challenge, our twitter and instagram address is @vanfoodster and the hashtag is #PizzaChallengeYVR please include this hashtag in all your tweets, instagram stories and instagram posts during the challenge. 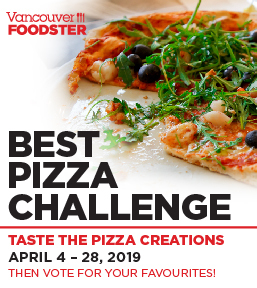 Get some friends together and make a night of it, visit 2 restaurants or more to share and taste the different pizzas or go solo or with a friend – just remember to VOTE for your favourites between April 4-28, 2019. 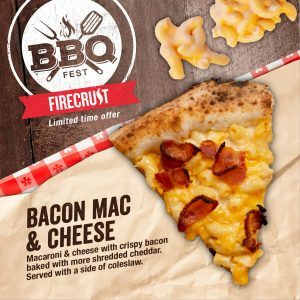 Here are the Pizza creations in this challenge, listed in no particular order other than when they were received by us. 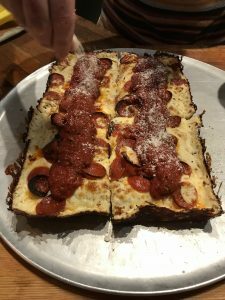 Description: Hand stretched, authentic Neapolitan style crust made with “00” Caputo flour, mixed with some comfort food! Crispy bacon, baked Macaroni and Cheese topped with more shredded cheddar cheese. Served with a side of coleslaw. 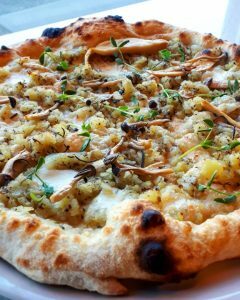 Ingredients: Italian Black truffle, potatoes, mushrooms, Asiago cheese and fior di latte. Garnish with rosemary and pea shoots. 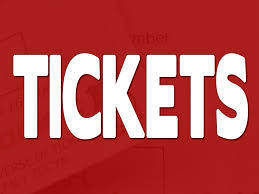 Offered: all the time Tuesday – Sunday. 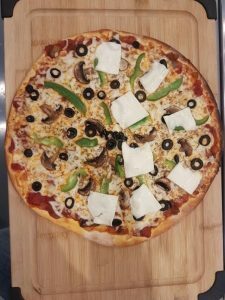 Description: Middle Eastern inspired 12 inch pizza with our House pizza sauce, topped with mozzarella cheese, green peppers, fresh mushroom, black olives, fresh Roma tomatoes slices and a signature of home made Akkawi cheese. 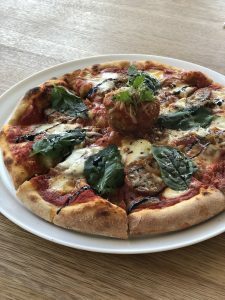 Description: A glorious Italian pizza pie with our signature meatball on top of the red sauce base pizza that has been topped off with sliced meatballs, caramelized onion, caciocavallo, pecorino, basil, oregano, finished with garlic focaccia crumb. Description: A pizza that brings the Rusticness of Italy into the Moderness of Piva. Offered: To be enjoyed at lunch and dinner. 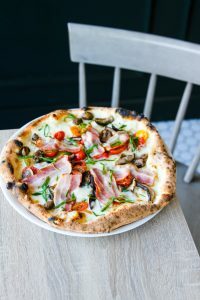 Ingredients:Taleggio cheese, smoked pancetta, cherry tomatoes, mixed mushrooms and green onions. 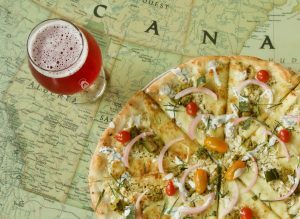 Description: Our White Sauce base of Grana Padano and Mascarpone Cheese mixed with the addition of a Saffron Tea, match-sticked roasted Leeks, Gelderman Farms Bacon, Calabrese Peppers, and topped with fresh Dill. 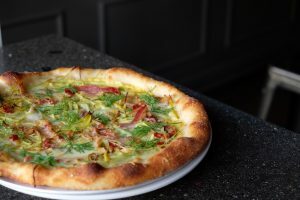 Ingredients: White Sauce base of Grana Padano, Mascarpone Cheese, a Saffron Tea, match-sticked roasted Leeks, Gelderman Farms Bacon, Calabrese Peppers, fresh Dill.